The design of the Shell Bed was inspired by furniture classics. In Greco-Roman times, the shell was a favorite decorative feature, traceable to such seafaring peoples as the Aegeans. To both the Greeks and the Romans, the shell signified fertility and was associated with Aphrodite, the Greek goddess of love and beauty, and with Venus, the Roman goddess of the same attributes. Botticelli’s famous 1484 painting, ‘Birth of Venus’, shows Venus being lifted from the sea on a beautiful, symmetrical scallop shell. Diverse architectural designs, including the cathedral niche cap, the dome, shell-hooded porches, and the spiral staircase, were all inspired by the scalloped shell. 18th century furniture makers, such as Thomas Chippendale, appreciated the proportion and symmetry of the scallop shell. Chippendale incorporated it into his designs, realizing his world-traveled customers would also value the shell’s symbolism. Rococo, the highly ornate French style, which sought to glorify nature, was named for the rocaille (rock) and the coquille (shell). 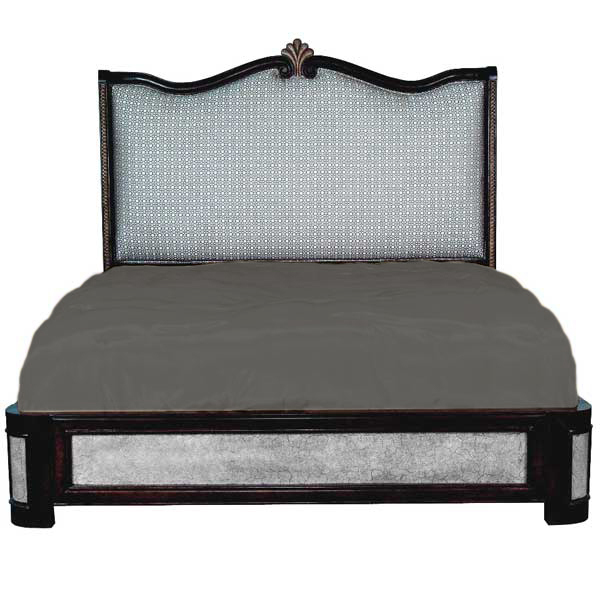 The Shell Bed was designed by Shah Gilani, ASFD, and is available in king and queen sizes. It is offered in a variety of finishes and accents. The Shell Headboard is also available by itself. Upholstery is in COM. With its classic elegance, it makes an exceptional bed for upscale residential and hospitality interiors. Custom sizing is available.